Photo courtesy Olive Tree Bistro. Rack of Lamb. Photo courtesy Olive Tree Bistro. Try one of the Cold Tapas and Mezze. Photo courtesy Olive Tree Bistro. One of the desserts. Photo courtesy Olive Tree Bistro. We regret to report that as of January 2010, the Olive Tree Bistro has closed. 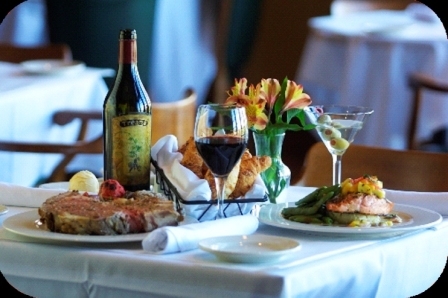 Olive Tree Bistro was a finalist for the 8 Wonders of Kansas Cuisine because as the flagship of the Latour fine-dining restaurants and because of its award-winning Mediterranean cuisine and service. The Olive Tree Bistro offers Mediterranean cuisine with an international, gourmet twist. The family owned and operated restaurant prides itself on exceptionally fresh ingredients buying locally grown produce, hormone-free beef as available and flying in fresh seafood. Pair this with exceptional service in an elegantly appointed dining room and guests enjoy an incomparable, sophisticated dining experience. It was with a philosophy of excellence that Antoine Toubia, a native of Lebanon, began to change Wichita's definition of dining. Toubia loved the Mediterranean roots, culture and hospitality that he had grown up with. It seemed only natural to encompass that while starting his first restaurant, The Olive Tree. In his own words, "It gave me an opportunity to try the same unique food I had grown up with, a menu for large families with large demands. We started with that menu and it just took off! We provided service and intelligently good products to our customers and we had fun doing it!" Although there was a fire that destroyed the original Olive Tree in its first year of operation, something was perfectly clear - there was a hunger that Wichita craved - Antoine's fresh approach to dining and the manner in which it was served, with warmth and hospitality. More than twenty years later, Antoine's legacy of excellence continues to grow and flourish. The Olive Tree Bistro has continued to distinguish itself among the best, receiving the prestigious DiRoNA Award in 1992-1993 (Distinguished Restaurant of North America) - a distinction that can only be awarded to a restaurant once in its lifetime. 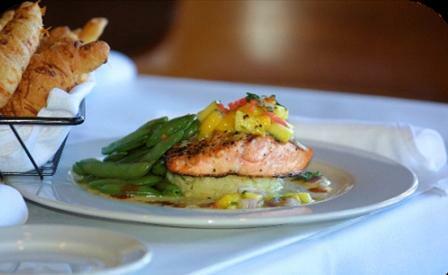 The Olive Tree Bistro has also received Wichita's only AAA Four-Diamond rating for the last ten years. Today, Latour Management has built a superior reputation as the most valued and respected food management and service provider in the city, which started with its founder, Antoine Toubia and is continued by the Toubia family and its employees. With more than 20 restaurants and contract locations in the Wichita area, Latour is a leading trendsetter of food management and service. The Toubia family legacy includes: Olive Tree Bistro (opened 1979), Bagatelle Bakery (opened in 1983), Piccadilly Market (opened in 1989), Piccadilly Grill East (opened in 1991), Piccadilly Express Cafe (opened in 1997), Piccadilly Grill West (opened in 1999) and Cafe Latour (opened in 2000). In addition to these fabulous restaurants and cafes, Latour provides food services to many contract locations to include Wichita corporations, hospitals and schools. The menu (hot link) categories are Cold Tapas and Mezze, Small Plate, Large Plate, and Desserts. The signature entrees include Rack of Lamb, Wasabi Crusted Scallops, Dodge City Rib Eye alla Fiorentina, Veal Picatta, and Blackened Ahi Tuna. Quality food and presentation. Photos courtesy of Olive Tree Bistro. A salmon dish. Photo courtesy of Olive Tree Bistro.